Add any eBook(s) to cart (no limit to number of eBooks), and proceed to check out. 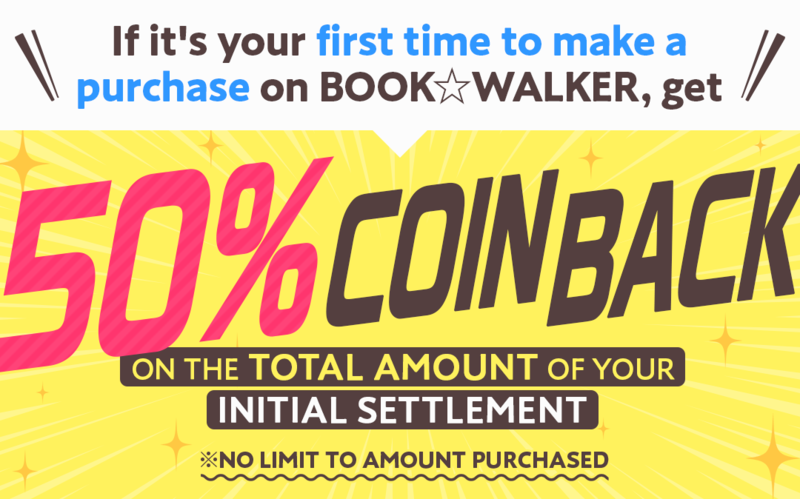 If this is your INITIAL purchase, you will receive 50% back on your total settlement (excluding tax) in BOOK☆WALKER Coin! 1 coin = 1 JPY (Japanese Yen). You can use coins to pay for your next eBook purchase! To be eligible for this campaign, your initial purchase must be made on the web store within 30 days after registering for a BOOK☆WALKER account. This campaign is eligible for users who have registered for a BOOK☆WALKER membership after 08:00 PM on March 31, 2019 PT (12:00 PM on April 1, 2019 JST). Coin-back is eligible once per person, regardless of whether eBooks are purchased from the Global Store ( global.bookwalker.jp ) or the Japan Store ( bookwalker.jp ). On your initial purchase, you will be granted 50% back in BOOK☆WALKER Coin based on your total payment (excluding tax). Granted coins will expire at the end of the following month in JST (Japan Standard Time). Downloading free eBooks are not counted as an “initial purchase”. This campaign does not apply for the [AppleID Store] which is offered in the Japanese language on the BOOK☆WALKER iOS App. Amount of coins granted through this campaign will not be shown under “Granted Coin(s)” on the settlement screen. ・If your initial purchase is a purchase through pre-order of an eBook, it will be eligible for this campaign if the eBook is purchased (through pre-order) within 30 days after registering for a BOOK☆WALKER account. ・After your initial purchase (check out), your second purchase and beyond will not be eligible for this campaign. ・Coins are granted within 15 minutes after your initial purchase. You may check your granted coins from Your Coin Information page. ・If you use a coupon when purchasing eBooks, coins will be granted based on the total payment after the coupon discount. ・If you purchase an eBook that is also eligible for another coin-back campaign, you will be get coin-backs for both campaigns. Please check the details of the coin-back amount on each campaign page. ・If the total amount of granted coins exceeds your total purchase (excluding tax) due to multiple coinciding campaigns, the total granted coins will be adjusted based on your settlement so that it does not exceed your total purchased amount (less than 100% of the purchase amount). ・1 Coin = 1 JPY, and can be used to purchase eBooks on BOOK☆WALKER. ・How can I use BOOK☆WALKER Coin? ・What payment options are available at checkout? ・The contents of this campaign are subject to change or cancellation without prior notice.